Help secure your home with us in 3 easy steps. And a representative we'll help assess your security needs. Congratulations, you're now in an ADT-protected home. ADT home security systems put just as much work in keeping your home safe and secure as you do. Our around-the-clock monitoring ensures that even when you aren’t home, someone is there making sure you don’t come home to any surprises. WHILE YOU’RE OUT, DON'T LET THEM IN. Homes are most vulnerable when no one is home. Arm your system from anywhere, or put it on a schedule that fits your needs. That’s how ADT home alarm security systems keep you and your entire home safe and secure. Whether you’re at home or away, ADT’s Customer Monitoring Centers are on call 24 hours a day, 365 days a year. Only ADT has ten Customer Monitoring Centers to provide you with fast response monitoring, because when our home security systems are triggered, a fast response really matters. Take comfort in knowing that you and your family are safe from harm any time of day. 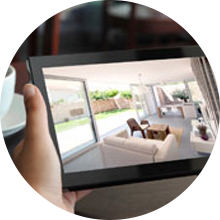 Our home security systems come with sensors which detect changes in temperature anywhere in your house. 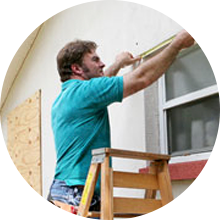 Protect your home from potential water damage during a flood. Once an alert from our home security systems is received, a trained ADT professional notifies you as quickly as possible so you can take action and intervene in any potential damage. Your security matters to us, so helping you choose the best home security system matters, too. Our home alarm security systems feature advanced technology combined with the human touch through our Customer Monitoring Centers.Below, you will find security options that are convenient, easy to use, and deliver the highest quality of protection you’ve come to expect from the leader in home security. The best home security systems allow you to see inside or outside your home in real time from your computer, smartphone or tablet. Easily install and expand the ADT home security system with wireless security. Ensure the home security system continues to work even if your landlines are down due to a storm. Lock and unlock your doors from anywhere, and receive alerts when someone else uses the home security system. 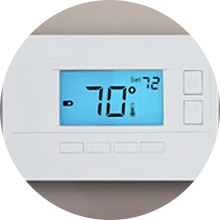 Control your thermostat from anywhere, anytime to better manage your heating and cooling usage. 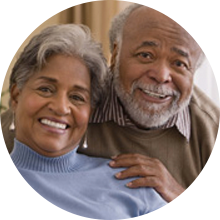 The medical alert system in our home alarm security systems feature a two-way voice intercom system which immediately connects you with a real person. 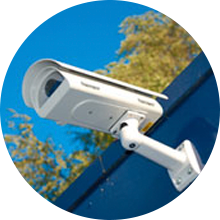 When an event is triggered through one of our home alarm security systems, every second counts. With six fully redundant Customer Monitoring Centers, you can count on us to deliver a fast response to you and the police. "I heard a loud noise at the back of my house. Glass was shattering from the sliding door on the patio. ADT called me right away and I told them to send help because someone was in my house. It is reassuring to know that ADT and the police officers were there." "One of the firemen the night of the fire said, 'Do you know how lucky you were tonight?'. But I like to look at it as, we weren't lucky we were protected (by ADT)." "Within minutes, every carbon monoxide detector on every floor of the house was going off and ADT called me immediately. Thank goodness ADT called me after three of my alarms kept warning me to evacuate and insisted that I do so." "ADT Tech did an excellent installation of our new wireless security system including camera and motion sensor plus garage door. He also instructed us on how to use the system properly. But this was just the end of an excellent process. I called ADT in the morning and entire system installed same day. Great customer service.Thanks and congratulations.- Alan T.."
"My wife and I had an ADT Pulse security system with an outdoor camera installed on the 4th. Our technician was Juan Nunez. He did an amazing job and was extremely professional. The installation was quick and everything works flawlessly. He showed us how to work the system on the keypad, online, and on the ADT Pulse app for iPhones. I want to say thank you for having a professional technician who showed up on time and worked efficiently." " I have been a customer with ADT for two years now and are very happy with our service. We wanted a camera in our home and yesterday Don Engstrum, the original installer, came out to install our new products. I didn’t know we were getting a whole new system with WiFi and he did an excellent job. He was very neat with the work he did and he gave us all the time needed explaining the new system and answering any question that we had. ADT and service people like Don are reasons people stay with a good company and I hope he gets recognition for the fine work he does. " Hi Tech Home Pros provides you with home alarm system offers from America's top rated security companies.